iPhoneFreakz _ All The Latest And Greatest iPhone News » iOS 4.3.3 Released: Fixes Tracking Bugs & More! iOS 4.3.3 Released: Fixes Tracking Bugs & More! 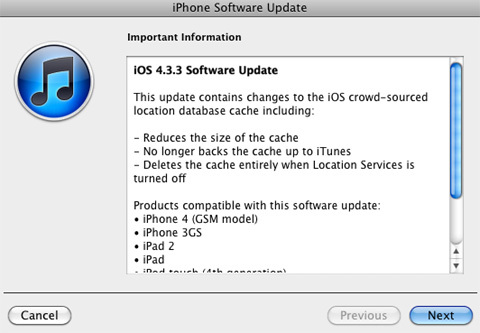 Just a quick heads-up: Apple just dropped iOS 4.3.3. This update contains changes to the iOS crowd-sourced location database cache, including: a reduced size of the cache [it’s only about a weeks worth of locational data now, as opposed to many months]. No longer backs the cache up to iTunes [Your new backups will no longer contain the consolidated.db file, making it a whole lot harder for a crazy spouse to take it and throw it into a third-party mapping tool to figure out roughly where you were at any given time), and Deletes the cache entirely when Location Services is turned off.